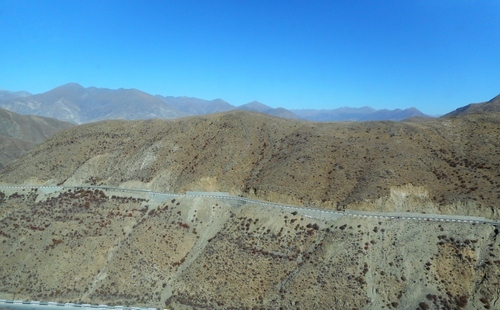 Our journey to Gyangtse took us along a branch of the famous ‘Friendship Highway’ which joins Lhasa with Kathmandu. This has to be one of the world’s most spectacular roads and I only wish I was doing it on a motorbike (I’ve done many of the big alpine passes, the Stelvio, the Gavia and the Col d’Iseran and feel that riding on two-wheels is truly the best way to appreciate these incredible vistas. You do become part of the landscape when biking). However, we did have frequent stops on our little bus and enjoyed the rarefied mountain air and breath-taking views to the full. The actual road is 920 kilometres long and reaches heights of above 5000 metres (well over 16,000 feet). It was built in the nineteen sixties to cut the journey time between Nepal and Tibet from almost two months to just a handful of days. Very often it is closed sometimes due to political reasons but largely because of landslides. The first part of our journey took us past some rocks with ladders painted on them.What was the meaning of them I wondered? The best version I heard was as follows: the ladders are painted to represent a divine bond between Tibetans and the Gods. These are spiritual ladders which allow one’s spirit to ascend to the heights more easily or, alternatively allow the Gods to descend upon the earth and sanctify it with their blessing. On our journey to Gyangtse we crossed three mountain passes. The first one was Gampa La pass, height 15,748 feet, which is a little less than thirty feet lower than Europe’s highest mountain, Mont Blanc (15,777 feet high). An extraordinary sight greeted us from the top of this pass, so richly decorated with prayer flags. It was the view of one of Tibet’s’ four sacred lakes, Yamdrok-So. (The other three sacred lakes are Lhamo La-tso, Namtso and Manasarovar). The intensity of the lake’s turquoise colour pitted against the highly sculptural barrenness of the mountains surrounding it and with a distant view of a snow-capped peak was stunning. The lake is over forty-five miles long and twists and turns like an undisciplined snake across quasi-lunar landscape. 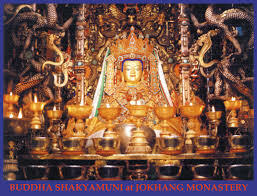 It’s sacred to the Tibetans as it is regarded as the transformation of the goddess Dorje Gegkyi Tso. For lakes, like mountains, are sanctified by Tibetans as they are the abodes of protecting gods. We were not just driving through some of the most spectacular scenery we’d ever come across, reaching heights we’ve never attempted before on Earth but we were also performing a pilgrimage which so many Tibetans undertake. Yamdrok-So is the largest lake in south Tibet and it’s said that if its waters run dry then Tibet will no longer be a habitable area – a severe warning indeed! The lake also has associations with Padmadambhava, the second Buddha, who introduced Buddhism to Tibet. We did not have time to detour to Samding monastery which was a real pity as it’s the only male Tibetan monastery to be headed by a female incarnation – a Dalai Lamaess, in fact. I couldn’t verify this as I couldn’t verify that the monastery has been rebuilt since it was one of the thousands destroyed during the disastrous Cultural Revolution. If you’re interested in more of the history of Tibetan Goddess reincarnations then there’s a book by Hildegard Diemberger (2007) called When a Woman Becomes a Religious Dynasty: The Samding Dorje Phagmo of Tibet. You can get it on Kindle at https://www.amazon.co.uk/When-Woman-Becomes-Religious-Dynasty-ebook/dp/B0092X8WHE/re . Definitely a Christmas book for some! The lake has good fishing and I noticed quite a few yaks grazing on its shores. Yaks are happy at these altitudes. It would be very cruel to bring them lower down. Our second pass, the Karo La, was the highest at 16,551 feet. It passes the foot of Noijin Kangsang mountain with its glacier. We stopped here too and looked at the local stalls filled with trinkets set up by villagers . There was an outstation here and I can definitely vouch that the toilets here are not to be highly recommended. However, we should be grateful for small mercies. With the lack of trees it’s difficult to find any sort of privacy. Perhaps women travellers should wear long Tibetan skirts to do their business by crouching without embarrassment. Noijin Kangsang is 23,641 feet high and was first climbed in 1986 by a Chinese expedition. I realised it was this snow-capped mountain that we saw from a distance over the turquoise waters of lake Yamdrok-So. I’ve heard that it’s not too difficult to climb so it could be an economic way of grabbing a Himalayan peak for the first time. Next visit? You’ll notice from the photographs that Tibet seems largely barren. The mountains aren’t prettily dotted with extensive forests as the Alps or the Apennines are. There are few opportunities for refuge from sun or the rare snowfalls and strangely the snow line only seems to start above 20,000 feet. If you want pretty mountain landscape go to the Austrian Alps. If you prefer powerful natural sculptures and vast areas of impressively desolate purity then Tibet is the place. There was a third pass to negotiate at only just over 14,000 feet before we descended to follow the fertile Nyang Chu valley which would lead us to Gyangtse. This was truly a breath-taking ride in all senses of that word. ‘Mozzafiato’ as one would say in Italian. I have only praise for the driver of our little bus! 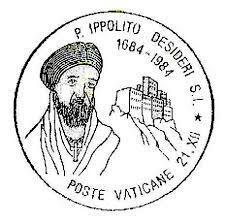 In the afternoon of our second full day in Lhasa we visited the same monastery which Don Ippolito Desideri, the Jesuit from Pistoia mentioned in my post at https://longoio2.wordpress.com/2016/11/27/a-morning-in-lhasa/ , stayed at back at the start of the eighteenth century and, indeed, where he was given his own chapel by the chief Lama to practise his devotions. The word ‘Sera’ in Tibetan means wild rose and, indeed, the site is still surrounded by wild roses. 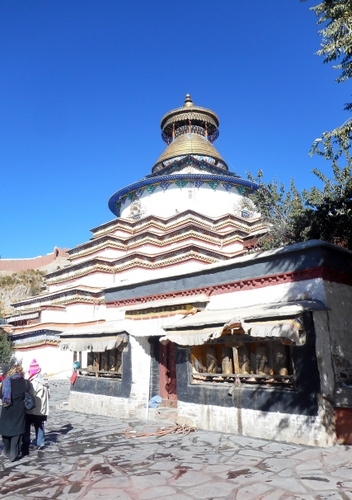 The original monastery was founded by Jamchen Chojey of the great Gelugpa (yellow hat) order in 1419 and houses a little over five hundred monks. As sadly with so many other monasteries in Tibet Sera suffered grievously during the Cultural Revolution with widespread destruction of its colleges and an untold number of monks (ranging into the hundreds) slaughtered. As a result of this massacre many monks fled south into India and established a parallel Sera monastery at Bylakuppe near Mysore. This Sera mark-two monastery houses around six thousand monks, nearly six times the number at the original site in Tibet. I must visit it next time I’m in the sub-continent. 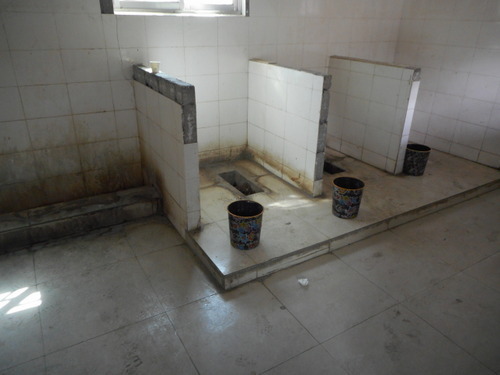 Fortunately there is little visual evidence of the horrors of the Cultural Revolution at Sera, Tibet. We found the monastery a very serene place filled with happy pilgrims and monks. The buildings looked very well cared for and intact and there was some work taking place to replace the drainage system in parts. I do feel the Chinese want to draw a curtain, as much as the rest of us, over what was going on in Tibet during those critical years between 1966 and 1976. Sera has some fine buildings including a large assembly hall but it is particularly famous for two things. Second, is the monastic university’s debate sessions. We were in time for the afternoon one and came across yet another of those extraordinary sights one encounters in the mountain kingdom. In the debating courtyard I noticed around a hundred pairs of monks, one sitting meekly on the ground the other striding around him and outstretching both hands clapping them and wildly twirling his auspicious rosary of 108 beads. What did all this noise and kafuffle mean I wondered? Translation please! Actually, each pair of monks represents a question-and-answer session. The standing monk or teacher questions the sitting monk or pupil. The arm gestures and clappings signify the beginning and the end of each question. If the teacher is annoyed by the student he circles around him (clockwise of course) three times. If anyone thought of Sera debates as something on the lines of the Oxford Union then think again. The ‘debate’ is, in fact, a religious quiz. Questions are generally closed ones by nature of the replies the novice is allowed to give and the subjects could relate to the relationship between Dharma and Karma, the nature of Samsara, truths about a Bodhisattva, even if a yak can be enlightened, the four noble truths established by Gautama etc, etc. I do wish more could have been explained to me about the questions asked but they are all on doctrinal matters. 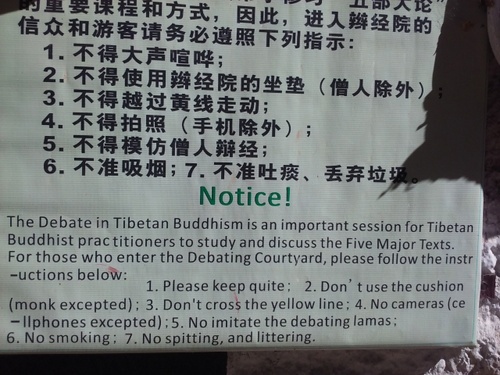 Afterwards I discovered that the Tibetan argument takes two forms to defeat wrong ideas and clarify understanding. The first type of argument proposed by a teacher is that of a syllogism made up of a thesis and a reason stated together in one sentence. The second is that of a consequence, similar to a syllogism but an expansion of the pupil’s answer. Listening to Beethoven’s fifth symphony is a transient experience because the sound starts and then after just over half-an-hour it stops. It is thus a product. The minor premise is that music is impermanent because it is a product of instruments starting and ending to play. The pupil can thus answer in one of at least three ways at the premises launched to him by the teacher. (3) “I accept it,” = accepting the argument and the conclusion. They then may have to take the ‘consequence’. The session did look and sound an odd way to question novices on their knowledge of the Dharma and Buddhist doctrinal matters. I would have been truly scared to be a novice at Sera! It was, however, fascinating to watch. But when I thought of the debate as a combat sport, spiritual rather than physical, it began to make more sense to me. Actually, this system of debate, or ‘closed dialectic’ as I’d rather prefer to term it, goes back a long way. It originated in India several thousands of years ago and apparently there was a similar thing going on among the Greek philosophical schools. Developing one’s awareness of the ultimate Truth and opening the doors of perception is indeed a systematic ritual. Whether, to outsiders, the ritual looks like the next thing to a pub argument is irrelevant for behind it all there are strict rules of procedure which both the teacher and pupil must observe. Incidentally, the system continues in Italian schools where oral examinations are as important as written ones and certainly in other religions although the rules of engagement may differ. I suppose in England the dreaded interview is the closest one gets to it. The word ‘argument’ also needs clarification. In English ‘to have an argument’ is usually taken to mean having an often rough disagreement between two (or more) persons. One can also use the word in the context ‘My argument for the existence of the yeti is etc.’ Argument or ‘argomento’ in Italian means something quite different than its usual English use, ‘L’argomento dell’Opera è’ means ‘the ‘plot of the opera is’ – argomento is never used in the context of a rough exchange as in English. It generally means a discussion or ‘point’. Certainly the debating sessions, for which Sera is particularly famous, seemed to me to draw a fine line between ‘litigare’ and ‘discutere’. I’m sure, however, that the novices, quickly learnt where they went wrong! Everyone, anyway, left on good terms. Sera Monastery has a big festival called Sera Bengqin on the 27th day of the 12th month of the Tibetan calendar (which is around February). It’s one of the coldest parts of the year but I’m sure that the crowds of pilgrims will do much to warm one up. It was great to see something of the monks’ daily routine at Sera but we were raring to see more of the country outside Lhasa. Our wish was to be satisfied, for next day we would be travelling through some of the most spectacular country I’ve ever seen and surmount three mountain passes, two of which would approach 17,000 feet in height.